Sarah (left): Walt Whitman wrote a sad poem, wherein he writes, "the lilac tall, and its blossoms of mastering odour." Aren't they, though? 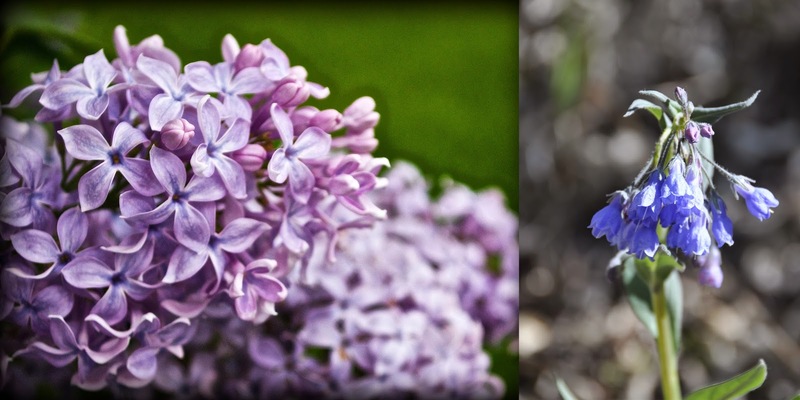 If our sense of smell is a gateway to memories hidden long ago, then lilacs are my port key to running along the Rideau Canal in university, inventing games with my brother in Grama's backyard, somersaults out front of my childhood home. They are part of the landscape in my personal narrative. If ever you have passed a bush in full bloom, you know the fragrance is powerful. In our new home, I am treated to wafts of lilac when breezes blow through our neighbour's yard and carry the scent into my open windows. Whenever I smell them, I get a feeling of having arrived. It is confirmation that, indeed, the long winter is over and warm, sunny days are here to be enjoyed. Johanna (right): After a long and dark winter, you know that summer is here, when the wildflowers begin to pop up. On our walks, we spot lupines and today I spotted some wild strawberry flowers.